The number of seals residing in the waters off the state’s coast is probably as high as 50,000, based on recent research. There are so many seals on the coast of Massachusetts that you can see them from space. Literally. If you zoom in on Cape Cod using the satellite photo feature on Google Maps, you won’t miss the herds of seals scattered along the coast. Start at the southern tip of Monomoy Island near Monomoy Point and move north on the ocean side of Monomoy Island. Kimberly Murray, a research coordinator for the seal program at the National Oceanic and Atmospheric Administration’s Northeast Fisheries Science Center, said officials this year observed up to 25,000 seals off of Massachusetts in a single day. The number of seals currently residing in the waters off the state’s coast is probably as high as 50,000, based on recent research that also factored in the number of seals in the water. 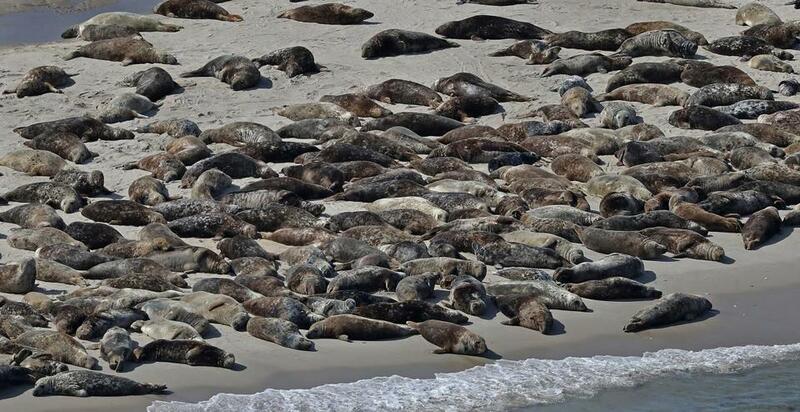 That’s more seals than there are people in any single town on the Cape and more than eight times as many people as there are in Chatham, which encompasses Monomoy Island. “The seal population does appear to be increasing locally,” Murray said. Globe photographer David L. Ryan got an aerial view of the large seal colonies on the Cape in 2015, and reporter Steve Annear got a closeup look at the animals in 2016 when he accompanied members of the International Fund for Animal Welfare on a mission to rescue entangled seals. In April 2016, stunning video of the seals was also posted on YouTube. The increasing seal population, while a natural marvel, has a possible downside. Seals are a favorite food for fearsome great white sharks, which also have been spotted in growing numbers off the coast, sometimes coming close to people in the water. Kathy Tevyaw, deputy superintendent of the Cape Cod National Seashore, said the increase in the seal population coincides with the implementation of the Marine Mammal Protection Act of 1972, which protects animals like seals from human predation. “As seal populations recover from the effects of human predation, great white sharks have returned to the shallow waters of Cape Cod to take advantage of this natural food source,” she said in an e-mail to the Globe. Sean Hayes, the head of the Northeast Fisheries Science Center’s protected species branch, which includes the seal program, said seals may actually be good for the economy. He said tourists have been paying to go on seal and shark watches, “bringing in some positive revenue dollars” for coastal towns. Seals also pose no threat to the beaches in terms of altering the environment in a negative way, Hayes said. Alyssa Meyers can be reached at alyssa.meyers@globe.com. Follow her on Twitter @ameyers_.